Solar powered bird baths usually combine a traditional style bird bath with a fountain powered by the rays of the sun as opposed to electricity or battery. I do like the idea of a beautiful bird bath with the added luxury of a spray of water adding a splash for the birds and the sound of water for me. And powering your bird fountain with a solar source means less running cost for you, and a greener source of energy. 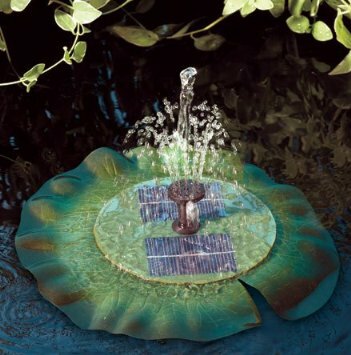 Power is supplied to the bird bath by a small solar cell or panel. The water is pumped through a central reservoir and circulated through the fountain. As long as the sun shines, your fountain will run continuously. Baths can be made of plastic, metal, ceramic or resin. 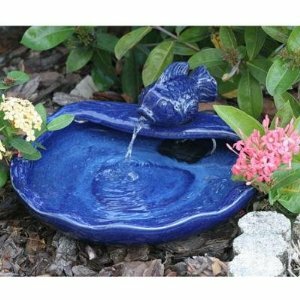 Ground bird baths and pedestal bird baths can be used as solar powered bird baths. pedestals work better as the added height keeps the the solar cell clear of leaves and other debris that could keep the sun off it. The solar cell can be mounted directly in the water basin or as an external cell which allows the cell to be placed a short distance from the bath. Make sure it is placed in full sunshine. Not suitable for use in winter. Be careful when cleaning the cell as it can be delicate. Be sure to keep the cell clean so that it can absorb as much sunlight as possible. Make sure the fountain does not run dry as this can damage the pump. Have a look at our Solar Powered Bird Feeders for a really "green" garden! This charming floating lily will enhance any garden! Just place on top of any water surface and the solar powered pump will start working. Put in a large bird bath or pond! Make sure the water does run dry as it will stop working. Provides about a 6 inch spray in direct sun. Simple to follow instructions and easy to assemble. Little angel sitting next to the bath with a bird on her hand. Solar panel is at the back of the statue with an on/off switch. Can use indoors or outdoors. 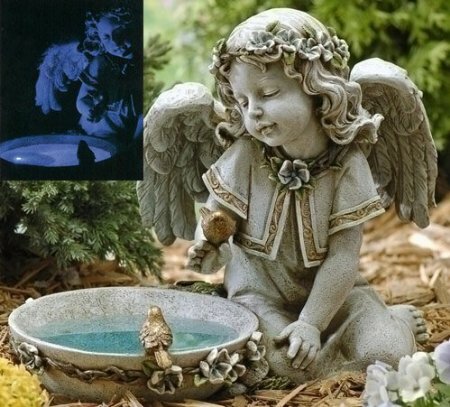 Glows at night and adds a lovely ambience to your garden or patio. I love it because it is so pretty!